At the Christian Dior show this past Paris Fashion Week, Jessica Michault tweeted a photograph of five unknown (to us) gorgeous Chinese women sitting together in the front row, with the caption “The future of the fashion world’s front row.” And she’s right. According to Emma Charlton in her story "China&apos;s passion for fashion on show in Paris" in the AFP, "China&apos;s luxury market is forecast by McKinsey & Co to soar to 27 billion dollars by 2015 -- one fifth of the world total -- up from 10 billion dollars in 2009." "It is a country that is passionate about fashion, like all emerging nations where appearance is of the utmost importance," Didier Grumbach, head of France&apos;s fashion federation, said at a "China in Paris" cocktail party. Fashion bloggers are also a thing in China. Last year, Chanel hosted a group of them at their fall 2011 show, where they sat in the front row. China has been building a front row presence for a while now and it’s never been as visible as it was in Paris last week. Of course, China’s presence at fashion shows reflects much more than Chinese actresses taking a sudden interest in western fashion. China has become a hugely important market for the fashion industry: designers are opening up more shops in China; designers are doing collabs and exclusives with retailers like Lane Crawford; the CFDA has launched an exchange program with Chinese designers; Net-a-Porter is launching there; and Chinese models are more in demand than ever. So, it follows that designers want Chinese celebrities in their front rows--in the same way that American celebrities are desirable front row guests because of the attention they draw from American consumers. • There are celebrities in China who have become known for their style. “Celebrities in China also make big fashion statements to get noticed,” she said. • Eventually, China will start to have more interesting independent magazine titles that may eclipse American titles down the road. 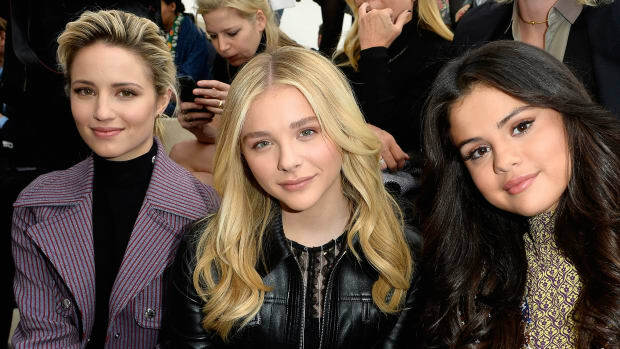 Click through to learn a little bit more about the starlets we saw at shows like Chanel and Dior. They are definitely ones to watch. It's not a secret that celebrities get paid to sit front row at fashion shows. We've covered this phenomenon in the past, noting that some celebs may get up to $100,000. And just this week, the New York Post reported on the topic again. But contrary to the Post's story, which posits that brands are still shelling out for celebs, we believe this trend is on its way out. If you really want to get the general public buzzing about your brand, you'd better have a major celebrity (or 10) cheering you from the FROW.